Want a FREE silicone wedding band!? Simply share about us on Facebook or Twitter, using the link below & we will include a FREE silicone ring in your ring box after you purchase! In-stock designs & "Homeless Rings"
LEAD TIME: Our lead time for titanium rings is 6 WEEKS from the date of purchase or 8 WEEKS if you are ordering a ring containing any other metal (gold, silver, black zirconium, damascus, etc.). Please note that custom commissioned rings always have the possibility of taking longer than our standard 6-8 week lead time. Designing a custom commissioned ring takes time and extra care to ensure we can make the ring you have envisioned come to life. This extra time accounts for sourcing custom stones, CAD design, or custom casting of a new original design and the complexity of that design. We urge you to plan accordingly and give yourself extra time by working with our design team and ordering as soon as possible. We encourage you to reach out to our designers with any questions about lead times for custom commissioned designs not already show on our website. Don't delay, design now! If you're in a time crunch and need your ring sooner than our 6 - 8 week lead time we do offer a rush service fee. Please email us at info@stagheaddesigns.com for further details! VARIATION IN MATERIALS: Because we use natural and unique materials in our rings, variation must be expected. No two rings will look the same, making your ring truly unique! Each piece of natural material will have unique patterns, grains, colors, etc. so you may receive your ring with materials that are much darker or lighter than what is pictured. SIZING: Our rings are true to international sizing standards, within a tenth of a millimeter. Before ordering, we recommend getting sized by two or three reputable jewelers following our sizing guidelines. You will need to be sized using rings that are in the same width as the ring(s) you will be ordering. For Wider Rings: (6mm-10mm+ wide): We recommend being sized using STANDARD fit rings (not comfort fit) that are the same width as the ring you would like to order from us. Most of our men's rings default to 6mm or 8mm wide. Please do not use the thin sizing rings that jewelers have as these are not accurate for wider rings and an actual ring will be tighter (because of added width) than the sizing rings that are used. If possible, get the millimeter measurement of the inside diameter of the ring that fits with a digital caliper. This will always be the most accurate way for us to size rings, however if this is not possible the ring size provided will be accurate if sized correctly. For Narrow Rings: (1mm-5mm wide): We recommend being sized using rings that are the same width as the ring you will be ordering in, if at all possible. If a matching width is not available at the jewelers we have also found that measurements given from the thin key ring sizers are generally accurate for rings made in a 1mm-5mm width. Lastly, do not allow a jeweler to give you a size according to a "ring-sizing dowel", as in our experience this measuring method and reading be very inconsistent. If a ring is ordered in the wrong size we do not offer free resizing or remakes, so be sure you are sized correctly! We are confident that if you take the time to try on rings following our guidelines that the ring we craft you will fit perfectly. Please visit our sizing guidelines page HERE for further information. CARE GUIDELINES: While we do everything we can to make each ring as durable as possible, they are made using natural materials which are more susceptible to damage from water exposure, impact, chemicals, scratching, and other outside forces than solid metal rings would be. We are always working to improve the quality and durability of our products and have recently developed a more overall durable sealant. As long as the sealant on your ring stays in tact the natural materials will be safe. It should also provide a more secure barrier for the natural materials in your ring from impacts and scratching but cannot be expected to be as strong as a solid metal ring. The sealant does not provide a guarantee or warranty against water damage or breakage due to impact and other forms of abuse. If the design you chose features wood or antler with exposed edges (meaning the outside edges of the ring do not have protective metal edges) we would still advise that you remove your ring when coming in contact with water and any harsh chemicals, such as hand sanitizer. We do offer a lifetime-limited warranty which can be purchased to cover repairs, reseals, and more, throughout the life of your ring. These can be purchased within the listing of any qualifying ring that you select, or you can add the warranty to your cart by clicking HERE. Most can be cleaned using warm, soapy water and lightly brushing it to remove any substances on the surface. If you’re unsure how to clean your ring, please feel free to reach out for guidance. If your ring has prongs securing stone(s) we recommend having a local jeweler check the prongs at least annually to ensure they’re tight and securing the stones! To learn more about Care Guidelines and how to best care for your ring, please click HERE. To view our FAQs, please click HERE. We take pride in our craftsmanship and quality and do everything we can to make our rings as durable as possible. However, the materials we use are natural and thus can be vulnerable to water, chemicals and breakage from impact. 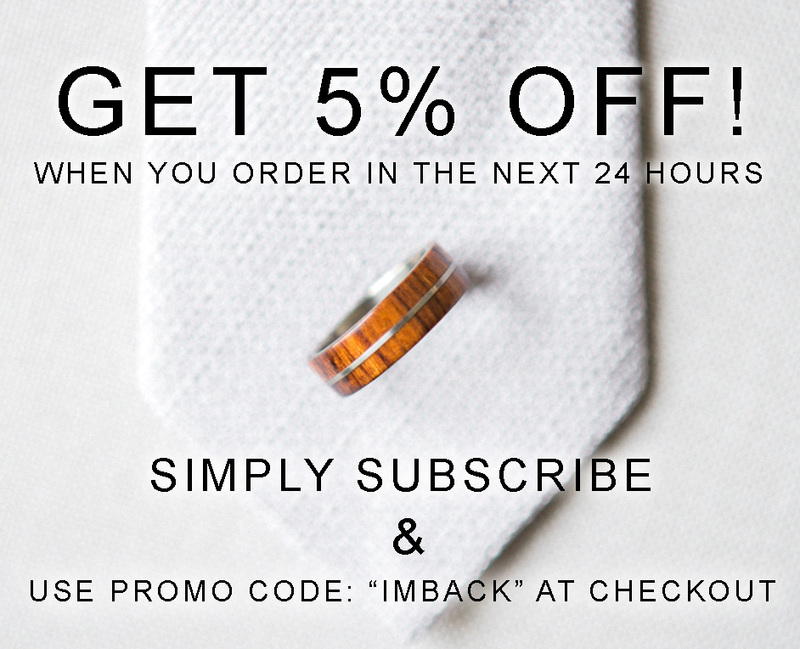 For this reason we are offering a lifetime limited warranty, which will give you peace of mind and keep your handcrafted ring protected and looking great for years to come! **Warranty must be purchased along with your ring or prior to receiving your ring in the mail. What Is Covered & Included? Water or Chemical Damage: Your warranty will cover any remakes or repairs of damage to the natural materials caused by water or chemicals. Impact, Scratching or Accidental Damage: Your warranty covers all remakes and repairs to natural materials caused by impact, scratching or other accident related abuse. *We do not offer free coverage or replacement for structural damage to the metal base of your ring, so please try not to drop a transmission on it. Keep your fingers safe. *We do not offer coverage for lost or damaged precious stones. 2 Free Reseals and Re-Polishes: We understand you love your ring and want to wear it everyday. If it gets worn and scuffed, send it back for a reseal and polish and we will send it back fresh and clean! 60% OFF Resizing Remakes: Due to the natural material used in your handcrafted ring, resizing your ring actually means rebuilding the ring from scratch. With the purchase of our lifetime-limited warranty, you will receive a 60% discount on your new, resized ring in exchange for your original ring. 20% OFF Remakes Due to Structural Damage: Although we cannot cover against structural damage to the base metal of your ring, we understand accidents happen and will offer 20% off the remake of a new ring. 4 Polishes: Using certain tools, we can buff and polish the ring to remove light scratching from the surface of the ring. For black zirconium rings, please be aware it will most likely be completely remade as the scratches will remove the top layer of black, which comes from the fire-treating of the metal. The ring cannot be fire-treated again, so we reserve the right to remake the ring completely. If you would like to purchase the warranty with your ring you will be provided the option to do so from the Material & Warranty drop down menu below. OTHER GIFTS: We also offer custom, matching cufflinks for any ring as well as groomsmen's gifts like hatchets and wood tie bars! Be sure to check out the Gifts page for additional products. We would be honored to craft a unique ring for you so you can WEAR AND BE WILD!